Google play store along with being a huge App store is also a source of many Errors which many of the users are facing which can be seen during installation or while Updating any App in your android device be it smartphone or tablet. The Errors are seen more in ICS and Jelly Bean compared to Kitkat. The Errors are seen in all the devices belonging to smasung, sony, LG, motorola etc. How to fix Error Code 495 in Google Play Store. How to fix Error Code 921 in Google Play Store. How to fix Error Code 941 in Google Play Store. So let us get back to the Solution for the Error 491 which you are facing while updating or downloading and installing your Apps in your android device. We have tried some simple tricks and some have worked and some did not so we are going to explain the three tricks which we found were helpful in the devices which we got the error in: Galaxy Tab 2 and Galaxy S4. This is a simple trick which is effective most of the times in helping you solve the error code 491 which we found to work on our Tb 2 when we got this error while updating Apps. In the box you wll find multiple options of Power Off, Restart and other options depending on the device. Tap on the Restart option and wait for your device to Turn off and turn on automatically. Now try to go and update or Install Apps from Google play store, if you are still getting the error then try the next trick. This should be done from the System Settings by ust following the steps given below. Make sure that before you go and do this step you have to Turn off Google play updates from the Play Store app. Open Paly Store and tap on the 3 dots option icon on the right or left side top of the screena nd from the list of options turn it off. From the List of Apps available in the All apps search for the Google Play Store App and Tap on it which will open a new window. 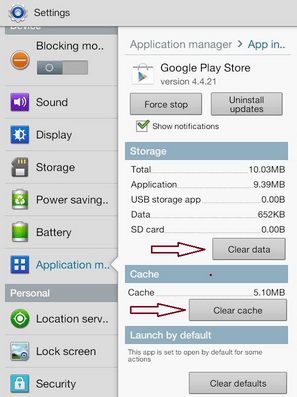 You should click on the Clear Cache button and Clear Data button as shown in the image below. Now Restart or reboot your device and try to install or update the apps which will most probably solve the problem. If you are still facing the same error and problem follow the next step. The error might sometimes be because of your Gmail account having problems syncing with your device so in this case we need to remove and clear all cache and data from the device and reboot the device. There will be an option Gamil Account and in case you have multiple accounts in your device then select the account which is synced with Google Play Store. Go to Google Play Store and try to install or update the apps which were causing the error and you will be able to do it without any problems. Thanks for following the post and do let us know your experience in the comments section whether it was helpful or not and if you have any other trick which was helpful do mention it so that we can add it to the list with due credit to you. I do all of this tricks but i still facing 491 error in play store help me. I did all these. but i still facing error 491. i m still waitng for any newest exact solution. Guys for three days I’ve tried to remove error 491 but nothing works. Am I the unlucky one here? I’ve tried different suggestions but nothing has helped. Anybody with any new idea?? This worked before but I have tried everything even a new Google account and the I still can’t update my apps. Did you try to remove the Google Account Synced into your phone and after restarting the phone, adding the same account back ? It helped many users who could not fix this even with a new account. 1.Go to 1moble.com and download the apk. This is another app store. 2. Download google+ from this app store on your phone. There is a security issue that is resolved in google+ for some reason this worked for me.